Click on the marker of your station, enter your name and comment. By clicking/tapping on a marker on the map that corresponds to your current location in the City. By selecting the Station from 'The Stations' dropdown in the top nav bar. Enter your name and comment in the form and hit submit (hit the (?) for a comment tip!). Your check-in will be immediately saved. Upload a photo from your phone or tablet by clicking the 'Choose photo' button, browse to the correct folder and click upload, or take a photo with your camera and click upload. If you're submitting a photo, ONLY TAP THE SUBMIT BUTTON ONCE. And be patient. Our uploader can take some time, especially if the photo's large. Visiting after the hike is over? Via the markers on the map. Via Stations dropdown in the top nav. Via "All the checkins" link just next to it. Filter your results by station! Thanks for visiting and/or participating in On The Road: The Scenic 49! 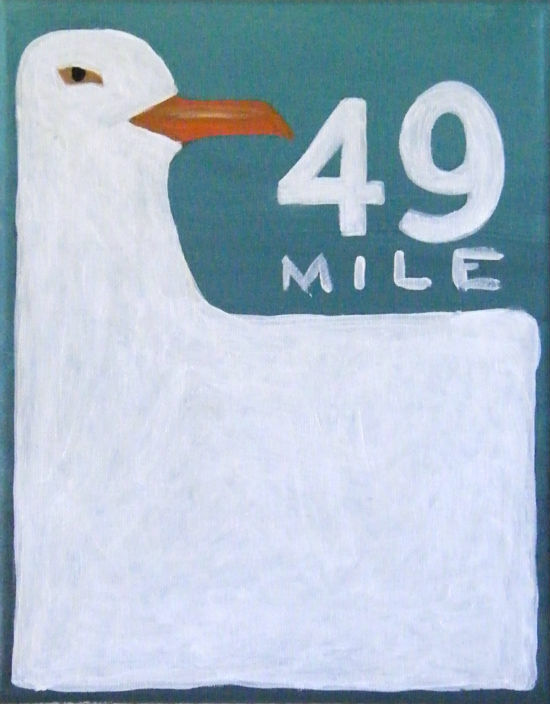 In On The Road: The Scenic 49, MAP artists Peter Foucault and Chris Treggiari will be walking the length of the 49 Mile Scenic Drive in San Francisco over the course of three days, March 13 – 15, 2014. Each day they will set up three different temporary interactive art installations along the route. On March 15th at 7pm, once the walk is complete, they will hike into Alter Space Gallery for the opening of Wabi/Sabi, a show curated by the MicroCilmate Collective. That evening they will set up a final interactive art project and install the equipment used in the expedition as well as documentation of the project created en-route for a one-month installation in the gallery. You can participate in this project too! Choose the neighborhood on the map in which you live, have strong feelings about or close ties too. We want to know your thoughts on what you love about it, what could improve or how it's changing. Once installed at Alter Space Gallery you can continue to add to our map. We want to hear your voice! Thurday, 3/13: Stations 1, 2 and 3. Friday, 3/14: Stations 4, 5 and 6. Saturday, 3/15: Stations 7, 8 and 9. Website created by Nico Crisafulli and Bryan Kahler. How is my neighborhood changing?